Postero-lateral arthrodesis involves stabilising two or more vertebrae by fusing them together using bone grafts and a metal framework (arthrodesis), which will hold the vertebrae in place while the bone grafts are consolidated. It is performed in cases of spinal instability, isthmic and/or degenerative spondylolisthesis, degenerative facet joint disease (facet joint arthritis), postoperative instability, recurrent herniated disc and degenerative scoliosis. Most of these have segmental instability of the spine, which is defined as the reduction or loss of the mechanical integrity of a mobile segment of the spinal column and which induces pain or neurologic symptoms when the spinal column is loaded. The main objective of lumbar postero-lateral arthrodesis is to minimise or eliminate the mobility of the affected mobile segment, increasing its load capacity. Surgical procedures to achieve bone fusion were already being carried out at the beginning of the 19th century, at which time they involved inserting bone grafts extracted from the patient into the posterior part of the vertebrae. However, the patient had to remain in a plaster bed for 6 months to reduce mobility and allow the consolidation (fusion) of the bone grafts. In order to avoid this long period of bed rest and increase the success rate of bone fusion, in the 1960s in Europe, and especially in France, surgeons started to insert screws into the pedicles of the vertebrae, which were connected together by bars or plates. Over time, these systems evolved; the first screws, which often broke, were substituted by other, more resistant screws, and the first plates and bars, which were very rigid, were substituted by elastic rods that allow certain mobility. However, the problem still remained: to insert the screws, rods and grafts large incisions were required, leaving extensive portions of muscle detached, devascularised and denervated. 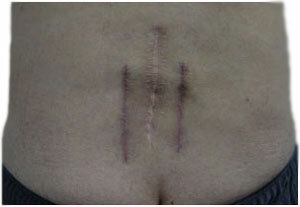 The postoperative recovery was long and burdensome, largely due to the muscle damage resulted from the surgical approach. In order to reduce the damage to muscle mass and achieve a quicker, but also complete, recovery, minimally invasive techniques have been introduced. This has not only led to a reduction in the damage to paraspinal muscle mass but also to a reduction in size of skin incisions, which had already been initiated by the introduction of the microscope and the endoscope, as well as with the invention of techniques using percutaneous nucleotomy or laser. Amongst these minimally invasive techniques we find percutaneous lumbar postero-lateral arthrodesis, in which, through incisions just a bit larger than 1 cm for each screw, it is possible to access large areas of the spine. The result is a faster recovery, a reduction in hospital stay and costs, as well as in the number of cases that require blood transfusions, and an earlier re-introduction to work. LAs with any new technology, it requires expensive equipment and the surgeon must have had highly specialised training, so these techniques are not available in all hospitals or for all surgeons. The procedure is carried out under general anaesthesia; but if the patient requires so, it can also be performed under local anaesthesia and sedation. Due to the fact that these techniques are not very aggressive, they can be carried out in patients that would otherwise not be able to have surgery, be it due to age or due to co-existing diseases, especially cardiac or respiratory disorders. It does not, either, require a blood transfusion, which is so common in conventional arthrodesis of the spinal column, and, in any case, our team has plenty of experience with bloodless surgery techniques. Percutaneous postero-lateral arthrodesis is shorter than traditional open-field spinal arthrodesis, enabling this procedure to be performed in older patients and patients with poor general condition. Oral analgesics may be administered to relieve any pain resulting from muscle damage. The patient will usually be ready for hospital discharge 48 hours after surgery. The lumbar postero-lateral arthrodesis has highly satisfactory long-term results, with pain relief for years. In some patients, after progression of their arthritis, this condition affects the vertebrae above and below the operated level and so they may start to hurt. This problem is usually solved with a facet joint denervation, but occasionally it may be necessary to repeat the surgical procedure, removing the previous material and inserting a new arthrodesis in more levels. Expanding screws, used in some arthrodeses, have usually very good results in the majority of patients, but cannot avoid over time the degeneration of nearby discs.